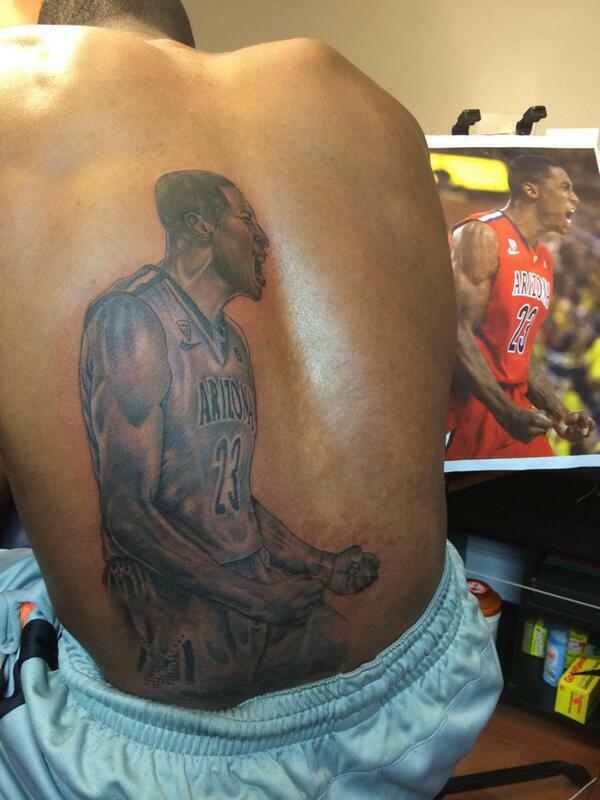 It’s been nearly a decade since a tattoo in the NBA really dropped jaws. Since Stephen Jackson’s praying hands with a weapon, or DeShawn Stevenson’s Abraham Lincoln portrait maybe. So the revelation that Brooklyn Nets rookie Rondae Hollis-Jefferson has a massive portrait of himself on his back has been a stunner. Stretching from his waist to his shoulderblade, the tattoo pictures Hollis-Jefferson in a moment of extreme emotion, fists clenched, veins popping on his neck, mouth open in a scream. Hollis-Jefferson explained to Newsday’s Rod Boone that the portrait is of a key moment in his career: at the University of Arizona, seconds after his momentum-shifting lay up led his team to a win against Michigan. In the same article, Hollis-Jefferson’s Brooklyn teammate Thaddeus Young asked, “Who gets a tattoo of themselves?” But Hollis-Jefferson actually isn’t the only guy in the NBA with a self portrait tattoo. Monta Ellis’s back piece stitches together snapshots of the player’s life, and just above his left hip is a picture of a smiling kid standing under a makeshift basket. It’s recalling the childhood court Ellis once described to Jonathan Abrams as “a garbage can on one end and a milk crate on the other.” Like Hollis-Jefferson, Ellis chose to commemorate a critical moment in his development forever on his skin. But perhaps the most striking tattoo of this type is the one on Al Harrington’s back: a shirtless, serene-faced Harrington being lifted by an angel. His real-life tattoos across his chest, stomach, and forearms are all replicated in this portrait, a fine attention to detail that truly makes the tattoo work. Between his hip and hand is a basketball. Every single one of these tattoos retain a common thread: that the game is central to who they are.